As grains of dust under His feet! It is the world’s largest functioning temple with 50 shrines, 21 towers and 39 pavillions. The temple complex covers 156 acres with seven prakaras or enclosures. Srirangam is a temple town on an island on the Kaveri river. At one time the entire population of Srirangam lived within the walls of this temple. Gopurams, Srirangam temple complex, Trichy, Tamil Nadu. The gopurams of the temple articulate the axial path, the highest is at the outermost prakara and the lowest is at the innermost. The Rajagopuram of the temple is the southern one which is 239 feet high, having been plated in gold. The Rajagopuram was stated to be built by Vijayanagara king Achyuta Deva Raya but it was completed by the Ahobila Matha in 1987. The diagram below shows structures in the temple complex; the gopurams, the mandapas, various shrines among others. Layout of the temple complex, image. Aerial photograph of Srirangam Island between Kaveri and Kollidam rivers. The main temple has been built based on Agama texts and is dedicated to Sri Ranganathaswamy. It is a Vaishnavite temple and has many legends associated with it.It is in the inner courtyard. There is 6 meter deity of Sri Ranganathar reclining on Adisesha with five hoods in the sanctum which is entered from the south gateway. The doorway has the dwarapalas or guards Jaya and Vijaya. The mukhamandapa is also called Gayatri mandapa leading to the round sanctum surrounded by a raised square, encircling pillars and an inner square. The other images are of Lord Vishnu on Sesha, Lord Ganesha, Lord Narasimha in Yogasana and Goddess Durga. The 50 shriens include Lord Vishnu temples, Goddess Lakshmi temple, shrines of various Vaishnave scholars. The temple structures have rich sculptural detail. The temple’s vimana is embellished with sculptures, and has carved pilasters with fluted shafts, double capitals and lotus brackets. The temple complex has many mandapas, frescoes, inscriptions on its walls, tanks and granaries. The inscriptions are over 800, from 9th century to 16th century of the times of the Nayaks, Pandyas, Hoysalas and Vijayanagara rulers, are in different languages like Tamil, Sanskrit, Kannada, Telugu, Marathi, Oriya and relate mostly to temple grants and gifts, rulers, nobles and temple management. Many of the temple structures have been renovated, rebuilt over time, though the temple was looted by different rulers. Among the mandapas the 1000 pillar mandapa is a theatre like structure built during the Vijayanagara period made out of granite. 1000 pillar mandapa, Srirangam temple. Warriors on horses, 1000 pillar mandapa, sculpture, Srirangam temple. Dancer and musicians, sculpture, Hall of 1000 pillars. Elephant being led by his mahout, sculpture, Srirangam. During the Vijayanagara rule the temple complex developed under Sri Krishnadeva Raya. The temple structures include the Sesharayar mandapa and the Venugopala temple which have amazing sculptural work. The Sesharayar mandapa was built during the Nayaka rule. The Garuda mandapa was also made during the Nayaka rule. It has a free standing seated Garuda. Kili mandapa is next to the main shrine, made during the 17th century. The Ranga vilasa mandapa is a large community hall with murals and narratives from mythology and the epic Ramayana. The temple has many wooden monuments like the Garuda vahana, Simha vahana, Hanumantha vahana among others. Sesharayar mandapa, Vijayanagar period, 16th century, Srirangam temple. With the pot of nectar, Sesharayar mandapa, Srirangam. Damsel, sculpture, Sesharayar mandapa, Srirangam. Woman warrior, Sesharayar mandapa, Srirangam. Sage Agastya, sculpture, Sesharayar mandapa, Srirangam. Venugopala shrine, Srirangam temple complex. Lord Krishna or Venugopala, Venugopala shrine, Srirangam temple complex. Sculptures, Venugopala shrine, Srirangam temple complex. Woman playing musical instrument, Venugopala shrine. Mithuna or loving couple, sculpture, Venugopala shrine. Woman applying vermillion, sculpture,Venugopala shrine. This entry was posted in art history of India, asian art, sculpture of india, Srirangam, Temple architecture, Temple art of India, Temples of India and tagged sculpture, sculpture of india, South Indian temples, Srirangam, Temples on September 3, 2018 by historyreads. The term Tadipatri means palm-leaf. It is a place in the Anantapur district in Andhra Pradesh, south of India. Tadipatri is famous for its awesome Vijayanagara temples with their style of art and architecture. Tadipatri came into prominence during Vijayanagara period. It was flourishing village during Chalukyas of Kalyani period. Vijayanagara kingdom was founded in 1336 A.D by brothers Harihara and Bukka when they declared independence from the Delhi Sultanatate. Tadipatri was developed by Nandela Viraraghavaraju. During the rule of Devaraya II Pemmasani chiefs emerged. The earliest member was Pemmasani Thimmanayudu who might have joined Vijayanagara service during Virupaksha period of 1460-85. His three sons were Ramalinganayudu, Yera Thimmanayudu and Chinna Thimmanayudu. The Bugga Ramalingeswara Swamy temple was built by Ramalinganayudu, a shrine of Lord Shiva on the bank of the River Penna, between 1490 and 1509, after he succeeded his father in governance of Yadikisima. He was a notable chief under Krishnadevaraya (1509-29). The temple is built of granite, richly carved with the superstructures in brick and stucco. Schist stone has been used like the Hoysala temples. Schist has been used in the gateways. The temple complexes at Tadipatri are well developed having a main shrine and a devi shrine each with an open rangamandapa. The main shrines in this temple complex are of Ramalingeswara, Parvati and Lord Rama. The other smaller shrines of Chandesa and Virabhadra are to the north and south of the Ramalingeswara shrine. Closed mandapa with porches in cardinal direction is seen in the Ramalingeswara temple. The temple complex has a prakara with gopurams to the south, west and north. There is a mandapa having the navagrahas in the north-east and at the south west corner, there is a kalyanamandapa. Carvings, Ramalingeswara temple, Tadipatri, Anantapur, Andhra Pradesh. Carvings, Ramalingeswara temple complex, Tadipatri, Anantapur, Andhra Pradesh. The main shrine stands on adishthana , has a mukhamndapa with porches on south and north sides, antarala and the garbagriha. The temple has rich sculpture in the niches, pillars and walls. The images of Lord Shiva include Kevalamurti in the gopura. Also images as Sukhasanamurti, Dakshinamurti, Uma-maheswaramurti,Vrsabharudamurti, Natarja,Ardhanarimurti and Bhiksatanamurti. Chandeswara is seen in a small shrine north to the main Ramalingeswara temple. The gopuras depict Parvati seen in sambhaga adorned with jewellery; the kiritamakuta,chandrakundala, kuchabandha,girdle and purnoruka. Lord Ganesha is seen in diffrent forms of Sthanakamurti and Nrityamurti or Dancing Ganesha. He is also seen as Yanakamurti or the riding form. He is seen as asanamurti or in a seated form. Temple view, Ramalingeswara temple, Tadipatri, Andhra Pradesh. The Ramalingeswara temple has images of Kumara or Lord Murugan (Kartikeya) riding a peacock, standing or in seated position. Goddess Durga is seen depicted in the Gopura in various forms. Lord Brahma, Goddess Saraswati , Surya are also depicted. The saptamatrikas Brahmi,Vaisnavi,Indrani, Chamunda, Maheswari,Kaumaari and Varahi are seen in the open mandapa. Lord Vishnu is seen seated on adisesa in the Ramalingeswara temple. Lord Vishnu riding on Garuda is depicted at the north gopura of the temple. Goddess Lakshmi is is depicted on the north gopura of the the Ramalingeswara temple. There is a shrine dedicated to the 12th century reformer, Ramanuja. A tall figure in the southern gopura of a noble is of the builder with a tall conical cap and short waist cloth. The temples at Tadipatri have upapithas. The wall pattern shows bays and recesses. Doorjambs have two or three jambs, the broad jamb has salabhanjika sculpture. Ceilings are like a grid with coffers with lotus medallions or a dome having three tiers and a big pendentive. Bas reliefs are mostly found at Tadipatrit temples. In the niches smaller deity figures have been placed. Carvings on ceiling, Ramalingeswara temple, Tadipatri, Anantapur, Andhra Pradesh. Carvings, North gopura, Ramalingeswara temple, Tadipatri, Anantapur, Andhra Pradesh. 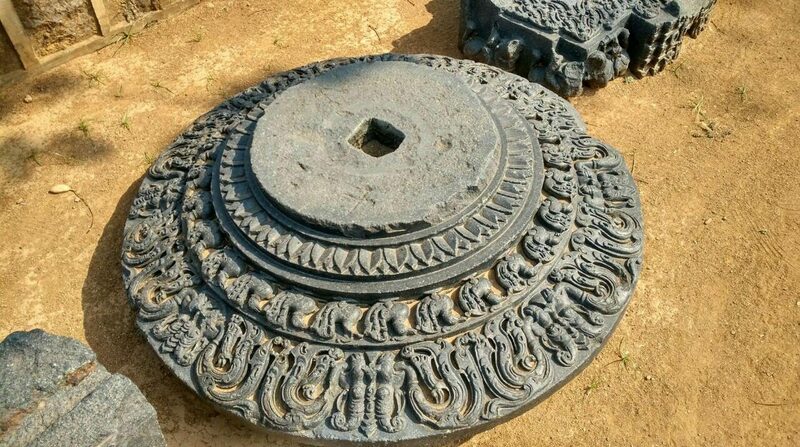 Hoysala artistic influence is seen in the sculpture; similar motifs, kirtimukhas, floriate arches etc. There is resemblance in the jewellery depictions too. Facial features have similar prominent eyeballs and high eyebrows. The art at Tadipatri bears resemblance to the Chennakesava temple at Pushpagiri. The temple depicts contemporary life depicting wrestlers, warriors, shepherds,hunting scenes, monkeys and horses. Carving of salabhanjika, Ramalingeswara temple, Tadipatri, Anantapur, Andhra Pradesh. Temples of Vijayanagara/Jayaprada, V, Delhi : Bharatiya Kala Prakashan, 1998. This entry was posted in art history of India, asian art, Tadipatri, Temple architecture, Temple art of India, Temples of India, Vijayanagara, Vijayanagara art and tagged Tadipatri, Temples, Vijayanagara, Vijayanagara art on February 3, 2018 by historyreads. The word Lepakshi means painted eye. The temple at Lepakshi, a village, 15 km from Hindupur in Anantapur district of Andhra Pradesh in south India is an excellent example of Vijayanagara art. Initially there was considerable influence of Hoysala and Kakatiya idioms , the style developed its own uniqueness by mid-15th century. The main centres to study, reflect upon and admire their art and architecture are at Hampi, Lepakshi,Tadipatri, Melkote, Kolar, Bellary, Chikballapur and Chamarajnagar. The area of Lepakshi is part of the Mysore plateau and is flat, made up of granite rocks. The rocka are seen in clusters and the area is surrounded by hills. This area was under the Mauryas in 3rd century B.C., later on the Satavahanas, then the Chutu kings….on.to Chalukyas of Badami, Rashtrakutas, Chalukyas of Kalyani and by the end of the 13th century when the Delhi Sultanate tried to control the whole of Deccan, they appointed two brothers Harihara and Bukka, sons of Sangama to control the political situation at Kampile. However they declared their independence and founded Vijayanagara a new city on the southern bank of Tungabhadra opposite Anegondi. They brought many adjoining areas under their territory. They made afort at Penukonda and made it their second capital. Lepakshi bacame part of their empire. The art and architecture of a powerful empire in south Indian history is well lauded since the style resonates with beauty and freshness. There are some gigantic sculptures inside the temple complexes which include mandapas with pillars which are aging richly carved. Themes from the epics and Puranic stories are depicted too. Musicians, dancers flora, fauna, contemporary society have been carved or painted. Sculpting was a hereditary art and well patronised by the rulers. They formed the panchala or five types of categories of craftsmen. The Lepakshi temple is synonymous with the Veeabhadra temple complex. 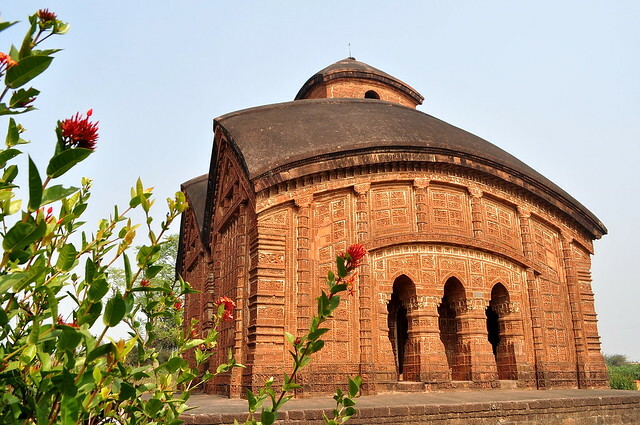 the temple is situated on Kurma-saila (resembling a tortoise back). The temples are the Papanaseswara and Raghunatha shrines. It is unclear about when this complex was started. The brothers Virupanna and Virana took keen interest under ruler Achyutaraya to develop the edifice into an outstanding example of Vijayanagara art. Mandapa pillars, Temple complex, Lepakshi, Anantapur,Andhra Pradesh. The temple complex was developed over a period of time (1100 A.D to 1800 A.D), made of granite. The structures are at three levels of the hillock, each one having an enclosure or prakara. The Papanaseswara shrine is the earliest one in the complex. Initially there were two shrines Veerabhadra and Papanaseswara, sharing a common platform with a mandapa around it. The Raghunatha shrine was added later was added to the western side of the prakara. The Veerabhadra shrine has its entrance to the north; the inner prakara in 432 square metres mainly developed between 1350 to 1600 A.D. several shrines, mandapas were added. The temple complex is an amazing planet of sculptures. The high relief sculptures are large and mostly depict Gods and Goddesses and the pillars of the mandapas. The low relief sculptures are done on walls, door frames and smaller compartments; demi gods, fauna, flora among others. Lord Shiva in different forms like Sadashiva,Dakshinamurti, Nataraja, Bhiksatanamurti, Kalyanasundaramurti,Devisahitamurti, Bhairava, Gajantakamurti, Andhakasura samharamurti, Veerabhadra is depicted in different places like pillars. Nagalinga, Lepakshi temple, Anantapur, Andhra Pradesh. Lord Ganesha is depicted at various places. He is in Lalitasana at the back of the Veerabhadra shrine, a large monolithic sculpture. Goddess Durga figures have also been carved at various places. She is seen as Mahisasuramardini,Uma and Bhadrakali. Lord Ganesha, Lepakshi temple complex, Anantapur, Andhra Pradesh. Lord Vishnu has been depicted as Narasimha,Kondandarama,Vamana, Kurma and Sri Krishna as Kaliyamardana and Balakrishna. Lord Hanuman has been carved at many places. garuda is found at different points,Goddess Lakhsmi,Gajalakhsmi is also seen. Lord Brahma,Dattatreya,Surya,Chandra,Indra,agni,Yama,Varuna,Vayu,Kubera,Ishana, dikpalasGoddess Saraswati, the saptamatrikas have all been depicted. Among the demi-gods, the ganas,rishis,pitris,dwarapalas,apsaras,gandharvas,kinnaras,nagas have been carved. In addition devotees, ascetics,warriors, musicians and acharyas (teachers) too find a place in the temple carvings. Also common people like shepherds, priests, wrestlers, potters et al. Some stories from the Puranas have been carved as well. The decorative motifs include geometric designs, kalasa,chakra,conch,sivalinga and nandi. The bull at some distance is an amazing monolithic sculpture, Basavanna. Nandi or Basavanna, Lepakshi temple, Anantapur, Andhra Pradesh. Architectural motifs like mandapas,shikharas, chaitya window are all depicted. Floral motifs like trees, creepers are seen. Flowers are also seen as decoration. Fauna or animals are shown as vahanas or in natural poses. Vyalas are also seen which are imaginery creatures, bit grotesque or fierce looking like simha-vyala,gaja-vyala and nara-vyala. The temple complex has simha-vyala and a few hamsa vyalas. Carvings, Lepakshi temple, Andhra Pradesh. Carvings, Veerabhadra temple, Lepakshi, Andhra Pradesh. Carved pillars at Veerabhadra temple, Lepakshi, Andhra Pradesh. Carved pillars at Veerabhadra temple, Lepakshi,Andhra Pradesh. Saptamatrika, Lepakshi temple, Andhra Pradesh. Celestial dancer, Veerabhadra temple, Lepakshi, Andhra Pradesh. Lepakshi temple : a cultural and archeological study/Rao, D. Hanumantha,Delhi : Bharatiya Kala Prakashan,2004. This entry was posted in art history of India, asian art, Lepakshi, sculpture of india, Temple architecture, Temple art of India, Vijayanagara art and tagged Lepakshi, sculpture, Vijayanagara on January 29, 2018 by historyreads.